If style points counted, on Thursday night at Viking Gymnasium, sophomore Miles Haughton (Mamaroneck, NY/Mamaroneck HS) would have scored 100. Instead, the shooting guard had to settle for a career-high 41 points to lead the Westchester Community College Men’s Basketball team to a 103-79 win over visiting Dutchess Community College. With the win, the Vikings improve to 6-1 for the 2018-19 season, and are 1-0 in Mid-Hudson Conference play. For Haughton, the 41-point, four-steal, four-assist effort told only half of the story. Most of his 41 points brought a raucous Westchester CC crowd to their feet as Haughton went 6-for-10 from three-point range, and hit a variety of dunks that would have made it to the most ambitious of highlight reels. After Westchester took a 19-point lead into halftime, and extended the edge to as many as 23 points to open the second half, Dutchess (4-3) went on an 18-5 run over a five-minute span to make it a 63-53 game with 14:19 remaining. However, Haughton scored eight consecutive Viking points to help extend the WCC lead to 16 points, and Westchester never looked back. For the game, Westchester shot 52% from the floor, including a 12 for 23 effort from three-point range, while Dutchess shot 37% and only hit eight of their 28 three-point attempts. WCC also rebounded the Falcons 46-40, and forced 19 Dutchess turnovers. The Vikings also had a huge game in the paint, outscoring Dutchess 46-28 from in close. Also for Westchester, freshman Joe Zayer (West Nyack, NY/Clarkstown South HS) had 15 points, eight assists, and eight rebounds, freshman Sean Hackes (White Plains, NY/Wakefield HS) added 13 points and three steals, and Fabian Johnson (New York, NY/Our Savior Lutheran) chipped in 12 points, and added eight rebounds. SATURDAY DECEMBER 1 (Valhalla, NY) – Freshman Joe Zayer (West Nyack, NY/Clarkstown South HS) scored a career-high 30 points. Zayer also pulled down six rebounds and had three assists. 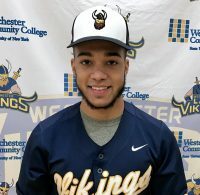 Sophomore Miles Haughton (Mamaroneck, NY/Mamaroneck HS) added 26 points to go with five rebounds, four blocked shots, and three assists, but the Westchester Community College Men’s Basketball team lost for the second time during the last three games, 91-81 on Saturday at Viking Gymnasium. With the loss, Westchester is now 6-2 for the 2018-19 season. Turnovers were the name of the game for the host Vikings as Westchester committed a season-high 24 of them, leading to a 30-16 disparity in points off turnovers. Otherwise, it was a game statistically closer than the final score indicated. The Vikings actually controlled play for much of the early going as four three-pointers during the first five minutes of play allowed Westchester to open an 18-13 lead with 12:32 to play in the opening half. However, a Haughton lay-up to make it 18-13 in favor of Westchester next came a 10-0 Monroe CC run to put the Tribunes ahead 23-18. A Zayer three-pointer with 6:44 remaining in the first half allowed the Vikings to gain a 26-25 lead, but Monroe outscored Westchester 16-8 down the stretch to take a 42-33 lead into halftime. The Vikings opened the second half playing inspired basketball, particularly off the bench, as huge plays from Chukwudi Ekezie (Bronx, NY/Bronx CC) and a three-pointer from Alhagieboe Dukuray (Brooklyn, NY/James Madison HS) tied the game at 45 with 15:55 to play. Two minutes later, a Zayer 3-pointer tied the score again, 53-53 with 13:13 to play. However, a 16-2 Monroe run gave the visitors an 80-66 lead with 3:22 remaining in the game. Westchester made one final run, cutting the deficit to six points with 1:36 to play, but Monroe converted several free throws late to ice the win. Overall, Monroe shot 46% to Westchester’s 43%, and out-rebounded the Vikings 43-40, a figure that was a double-digit Tribune edge as late as early in the second half. The Viking’s season opener, home against Dutchess, was postponed. It will be made up on a later date.